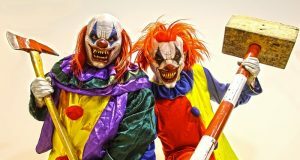 The Killer Clowns Are Back, And They’re As Terrifying As Ever! Girl Gets Revenge On Drunk Boyfriend With Epic Lady Boy Prank! Things Get Steamy In This Voice Activated RedBox Prank! Zombie In A Morgue Prank! Pokemon Dealer Prank Even Has The Cops Speechless! Britney Spears Pulls A Midnight Prank on Jimmy Kimmel!